A flamboyance of flamingos over the Boiling Hole Salina on South Caicos. Osprey at the coastal cliffs at the Highlands on South Caicos. The island of South Caicos is an amazing destination for birdwatching, with an interesting array of terrains that includes old salt salinas, coastal bluffs, and mangrove estuaries. South Caicos is great for both do it your self outings or organised guided eco-tours. Kayak or paddle board trips are also an excellent way to get to the best birdwatching sights. The best bird sightings near South Caicos are primarily the large and impressive wading birds such as egrets, herons, and flamingos. Reddish egrets, great egrets, cattle egrets, tri-coloured herons, green herons, great blue herons, yellow-crowned night herons, Caribbean flamingos, ospreys, and frigatebirds are the most common of the larger species. Smaller bird sightings include a vast array of coastal birds, Antillean nighthawks, mangrove cuckoos, American oystercatchers, and more. Peregrin falcons, American kestrels, rosette spoonbills, cormorants, long-tailed tropic birds, and West Indian whistling ducks can also be seen at times, yet are a little less common. For tropical dry forest species such as warblers, Cuban crows, hummingbirds, anis, bananaquits, and blue grey gnatcatchers, the brushlands of East Caicos and Hog Cay are exceptional for sightings. Reddish egret at the Boiling Hole on South Caicos. There are many locations on South Caicos that are easily accessible from the island’s resorts, yet are great for birding. The two luxury resorts on South Caicos, Sailrock Resort and East Bay Resort, are surrounded by beautiful landscapes, with potential sightings within a couple minute walk of the grounds. In previous years, South Caicos was once a mainstay of the sea salt industry in the Turks and Caicos, and today there are hundreds of acres of abandoned shallow salt salinas, which attract a wide range of wading birds. In addition to herons and egrets, Caribbean flamingo sightings are great, with the added bonus of the flamboyant birds being far more approachable than those at the mores isolated locations such as at the extensive Ramsar Nature Reserve in the Caicos Islands and at Lake Catherine Nature Reserve on West Caicos. The salinas are located in the centre of South Caicos, and access is easy from many roads on the island. The secluded and undeveloped Highlands region of South Caicos combines impressive vistas and great birding potential, especially for ospreys. The saline wetlands to the west of the Highlands area also a haven for many tropical dry forest birds, such as bananaquits and warblers. Frigatebirds over Moxy Bush near South Caicos. 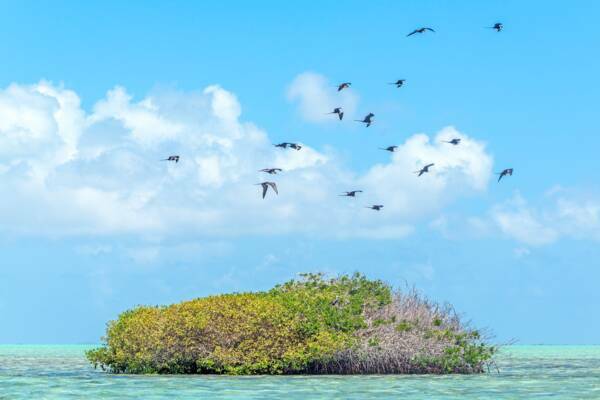 South Caicos is surrounded by some of the best birdwatching environments in the Turks and Caicos, and great locations can be visited by boat or kayak. Directly to the north of South Caicos are several small and uninhabited cays, including Plandon Cay, Middle Creek Cay, and McCartney Cay. 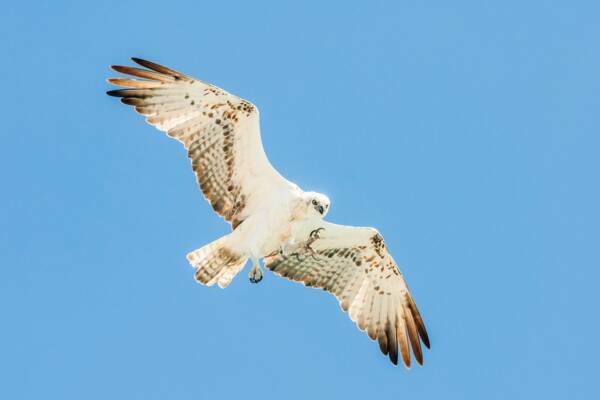 These channel islands likely have the highest density of ospreys of any location in the Turks and Caicos, and are also great for unexpected sightings, such as flocks of whistling ducks or soaring frigatebirds. Jerry Camp, a water landing used by fisherman and water sports businesses, allows for easy access to the Plandon Cay Cut area. As its name suggests, Long Cay is a very narrow and long barrier island on the edge of the Caicos Banks. This spectacular location is only minutes away from Cockburn Harbour and offer great beaches and wildlife sightings both in and above the water. Another interesting sight at Long Cay are the brown noddies that inhabit crevices on the limestone cliff faces at a few spots. Moxy Bush, a red mangrove clump off of South Caicos, is a rookery for frigatebirds, and an especially unique site in the Turks and Caicos. From a distance, these majestic fishing birds can be spotted from a long distance off soaring above the cay. 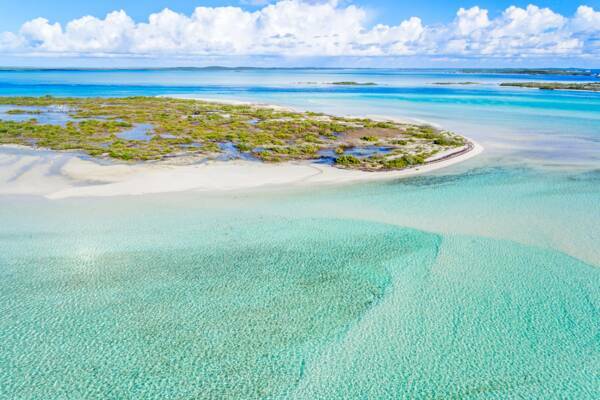 Some of the best red mangrove estuaries and channels in the Turks and Caicos are found surrounding East Caicos and Hog Cay to the north of South Caicos. 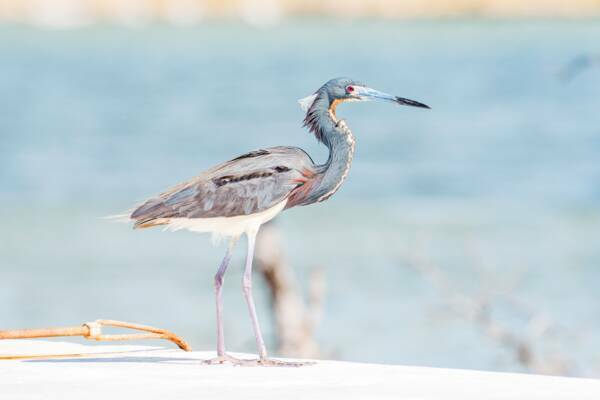 The extensive and shallow tidal channel that divides McCartney Cay from Hog Cay is home to the largest tri-coloured heron and reddish egret rookeries in the Turks and Caicos, and it’s not uncommon to see flocks of 15-20 of these majestic birds in the area. Plandon Cay Cut and the channel islands north of South Caicos. This area teems with marine and bird life.